Construction work on Horns Rev 3 offshore wind farm in the North Sea is well under way with the Port of Esbjerg as an important hub. 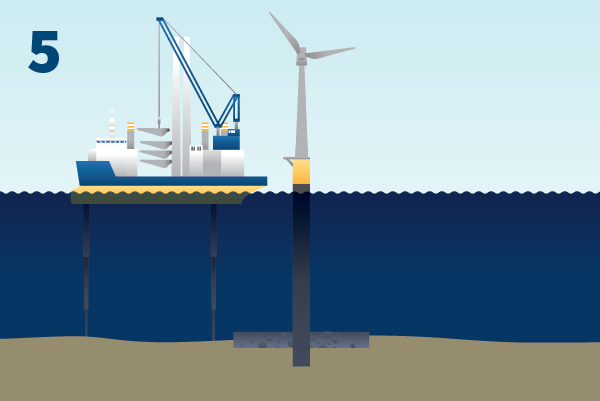 The wind farm will set new standards for the price of renewable energy from offshore wind farms and for the size of wind farms in Danish waters. See how construction work on the 49 wind turbines will progress up to the inauguration in 2019. Narrated by Vattenfall's Technical Project Manager Find Poulsen. 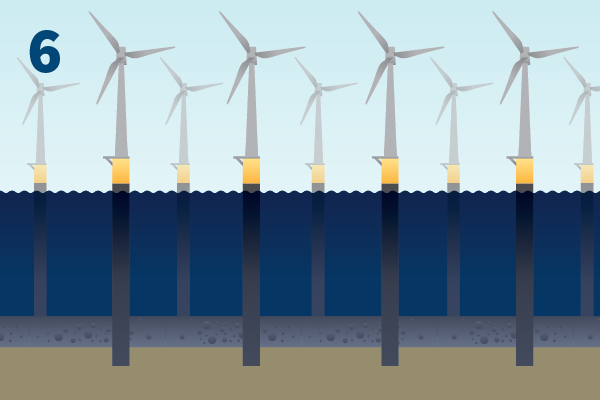 The project was won following a tender by the Danish Energy Agency in April 2015, and immediately afterwards Vattenfall began detailed surveys of the area to determine the best location for the wind turbines in terms of depth and seabed conditions. Soil samples were taken to optimise the design of the foundations for the position of each turbine. The water depths in the area vary from 10 to 23 metres. The area contains some minefields from the First and Second World Wars. The unexploded remnants of war from this time therefore also needed to be mapped. Two mines had to be disposed of by detonation. For the HR3 project, Vattenfall selected an MHI Vestas V164 turbine that, with a capacity of 8.3 MW, is the largest in the world. Work on the wind farm itself began in May 2017 with the laying of erosion protection on the seabed where the foundations are to be installed. This protection comprises rock hewn from Norwegian mountains and broken down into smaller stones arranged in a layer approximately one metre thick with a diameter of 33 metres. The granite layer prevents the current and waves from eroding the seabed around the foundations. The next step was to position marker buoys to help secure the area against disruption from other shipping and fishing vessels. The first foundations were installed on 14 October 2017. The foundations are so-called monopiles, i.e. 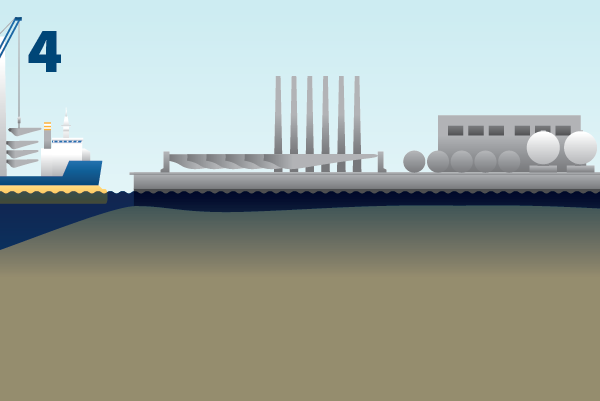 pipes of up to 54 metres in length driven into the seabed. They are 6.5 metres in diameter and weigh up to just over 600 tonnes each. The pipes, which were produced in Rostock, were sent four at a time on barges through the Kiel Canal to the Port of Esbjerg. The last of the 49 foundations was installed just before the new year. The substation collecting power from the turbines has already been installed by Energinet.dk, which has also completed the cable that will carry the power to land and to Endrup, east of Esbjerg, in Denmark. This is the site of the large substation connected to the new sea cable serving the Netherlands. Next, the so-called transition piece will be placed on the foundation. This extension of the foundation contains a great deal of electrical equipment and has an external platform with a small crane for lifting equipment and spare parts off the service vessels that will call at the turbines during the operating period. This work will commence in spring 2018, and the cable connecting the turbines to the substation platform will be laid immediately afterwards. The turbines will be linked in lines of four turbines each. For this purpose, more than 100 kilometres of cable of various dimensions will be laid, depending on how much power is produced by one or more turbines. In addition to the three cores and one earth connection, the cables will also contain optical fibre lines used primarily to monitor and control the turbines remotely from Vattenfall's surveillance centre in Esbjerg. 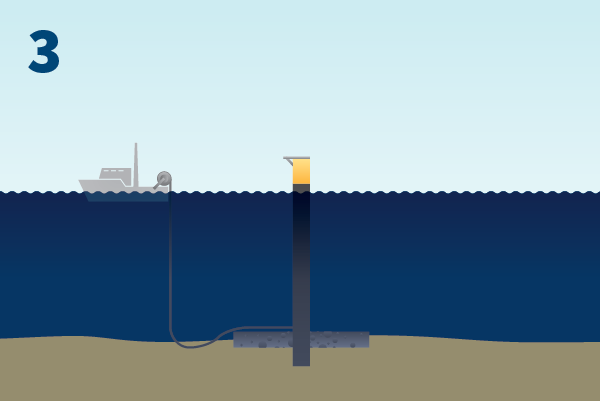 The cables will be hosed down one metre into the seabed to ensure the best possible protection against damage. In July 2018, Vattenfall will begin loading the turbines onto vessels at the Port of Esbjerg to transport them out to the wind farm. MHI Vestas will beforehand have assembled all parts of the turbines on the quay in Esbjerg. 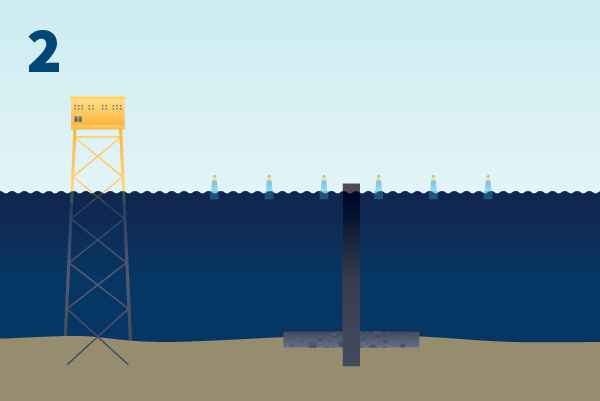 The tower sections, stacked on top of each other to make up finished towers, will be as completely fitted out with cables, service lifts and other equipment as possible before they are installed offshore. The blades will arrive in Esbjerg by ship from Nakskov and the Isle of Wight, whereas the turbine housings, called nacelles, will be assembled at Lindø Industrial Park near Munkebo on Funen in Denmark. To ensure that turbines are continuously ready for installation, MHI Vestas will always have eight towers under construction in Esbjerg. The turbines will be transported out to the wind farm and set up by a purpose-built vessel that is able to stabilise itself on the seabed using four supporting legs. These are powerful enough to lift the entire vessel out of the water. This will counteract the effect of waves and provide a stable base for lifting work. This is particularly important as the 350-tonne nacelles must be positioned at a height of precisely 100 metres on top of the towers. The vessel’s own crane will also lift the almost 80-metre-long blades into position one at a time. The vessel can carry four complete turbines with towers, nacelles and 12 blades. When set up, the final work of assembling the parts, drawing the cables and testing the whole system will be performed before the turbine is ready for testing. All being well, the last turbine is scheduled for completion at around new year 2018/2019. The turbines are now complete. 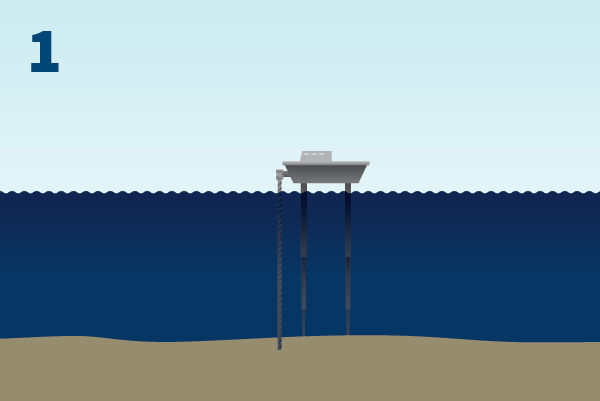 The hub height – rotor – is 105.6 metres above sea level. The blade span is 79 metres. The rotor measures 164 metres in diameter. Each turbine can produce up to 8.3 MW – sufficient power for the annual electricity requirements of more than 8,000 households. Vattenfall Vindkraft's agreement with the Danish Government therefore makes production from Horns Rev 3 one of the most economical in Europe at an electricity price of DKK 0.77 per kilowatt hour. With the construction of Horns Rev 3, and its capacity of 406.7 MW, Vattenfall is well on its way to becoming one of Europe's largest wind power producers. The wind farm will be inaugurated in the spring of 2019.